Seen with 21st century eyes, the images and objects in this exhibition linger in a romantic, comfortable past, but their significance and impact on photography and cinema give the show a peculiarly contemporary presence, a mute visit from the past that coyly unveils the building blocks for much of photography and cinema today. Eadweard Muybridge, a, walking; b, ascending step; c, throwing disk; d, using shovel; e, f, using pick. Plate 521, 1887. Collotype on paper. Corcoran Gallery of Art, Washington, d.c., Museum Purchase, 87.7.477. A comprehensive retrospective of Eadweard Muybridge’s explorations in locomotion and photography is now at the Corcoran Gallery of Art through July 18, 2010. Organized by the Corcoran and curated by Philip Brookman, chief curator and head of research, Helios: Eadweard Muybridge in a Time of Change includes numerous vintage photographs, albums, stereographs, lantern slides, glass negatives and positives, patent models, Zoopraxiscope discs, proof prints, notes, books, and other ephemera. The exhibit runs chronologically from his earliest works in stereo photography (3-D glasses are provided) to his landscapes of the American west, his surveys and work from Alaska to Panama, ending with extensive samples of his animal and people motion studies. Looking at the beautiful albumen silver prints is a treat for anyone who stares at a computer screen much of the day. The material quality of the vintage prints is nothing short of majestic, with all the serenity and fortitude the glorious west of the past is expected to have. They only become melancholic, or tragic, if a viewer compares these images to contemporary aerial photography that shows the state of the land today. 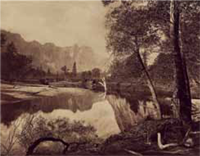 In Muybridge’s motion studies, the subject matter is usually less majestic than Yosemite or the Pacific Coast. Although the motion studies were technical extravaganzas to achieve, the subject matter is simple and straightforward, often boring and banal. Frozen in time-lapse sequences, people and animals parody gestures that will never headline at Cirque du Soleil – tossing a hat, pouring a cup of tea, walking up and then down steps (OK, there are some more gymnastic gestures). 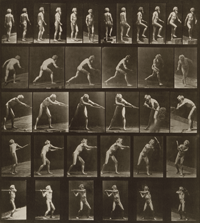 In his efforts to document the mechanics of movement, Muybridge proceeded by splintering the movement into chunky slices. They might have been made as quasi-scientific motion studies, but when viewed based on how they look not why they were made, there is an edgy pathos to these flickering slices of movement, a futility akin to the myth of Sisyphus. It’s difficult not to contemplate the images based on how they look. Despite sporadic controversies about the quality of programming and leadership, the Corcoran is a museum of art. Whereas movement can be equated with change, involving departure and arrival, these short flipbook-like clips endlessly loop through the same futile gestures, never leaving or arriving or sustaining – just moving. In the 1920s, Frank and Lillian Gilbreth attached glowing lights to wrists, arms, and legs of workers then filmed them working in the dark. These films were tools for consulting work on movement and efficiency. (Observing that surgeons spent too much time digging for tools, they suggested that surgeons keep their eyes on the patient and ask for tools as needed, thus, “Scalpel please.”) Like Muybridge’s locomotion studies, Gilbreths’ films, when contemplated for how they look not why they were made, evoke more misery than celebration, not the stuff for a propaganda campaign promoting the work ethic. The exhibition ends with the brilliant idea of installing a few contemporary works whose influences can be traced to Muybridge. His influences spread over painting, photography, and cinema. Included in this part of the exhibit are works by Mitchell F. Chan and Brad Hindson (Canadian team), Stacey Steeks, and DC’s own William Christenberry, to name a few. The motion picture industries, motivated by commercial interests more than scientific study, have turned Muybridge’s chunky movements into fluid blockbusters. Last summer, I participated in a video piece by then-local artist Lisa Blas (currently living in Belgium) that directly references Eadweard Muybridge. In the piece, called The Jump (in progress, not included in this exhibition), Blas, replete with skirt and heels, repeatedly walks down the sidewalk and leaps over a pile of books on the history of art. Eadweard Muybridge, Valley of the Yosemite. From Mosquito Camp. No. 22, 1872. Albumen silver print. Corcoran Gallery of Art, Washington, d.c., Museum Purchase, 2007.003. There was a great deal of mobility in Muybridge’s life, both geographically covering vast regions of the planet, and professionally interacting with numerous individuals also working on photography, motion, and cinema. Born in Great Britain, Muybridge (1830–1904) first came to the United States in 1855 and worked as a publisher’s agent and bookseller. A few years later, following a serious stagecoach accident, he returned to Great Britain and learned photography. When he returned to San Francisco in 1866, he quickly established himself as a qualified photographer, working mostly with landscapes and architecture. These images were published under the pseudonym “Helios,” which, in Greek mythology, is the name of the god of the sun. In 1872, businessman and race horse owner Leland Stanford – former Governor of California – hired Muybridge to use photography to answer the question: In full gallop, do all four horse hooves leave the ground at the same time? Unaided human observation cannot answer the question. Muybridge spent several years perfecting techniques to produce a series of photographs that do capture a moment with all four hooves in the air. Technically, this involved developing faster shutter speeds and faster emulsions to register the fleeting activity. In 1874, Muybridge shot and killed his wife’s lover. Though he confessed to the crime, the court acquitted him, labeling the crime a “justifiable homicide.” Stanford had paid for his defense, which included a failed attempt to plead innocent by reason of insanity, claiming that the earlier stagecoach accident had damaged his brain. After the trail, Muybridge traveled and worked in Central America before returning to the US in 1877. Between 1883 and 1886, he worked with the University of Pennsylvania and produced over 100,000 locomotion images. In 1893, Muybridge gave a series of lectures on the Science of Animal Locomotion in the Zoopraxographical Hall at the World’s Columbian Exposition in Chicago. He used his zoopraxiscope –“animal action viewer” -- to project his moving pictures, the first commercial movie theater. In 1894, he returned to England, published a couple of books, and died in 1904 at his cousin’s house where he had been living. A catalog will accompany the exhibition, and with essays by Philip Brookman, Marta Braun, Corey Keller, Rebecca Solnit, and an introduction by Andy Grundberg. Following its debut at the Corcoran, Helios: Eadweard Muybridge in a Time of Change will travel to Tate Britain in London from September 8 through January 16, 2011, and to the San Francisco Museum of Modern Art from February 26 through June 7, 2011. For more information about the exhibition, visit the Corcoran's website here. For more information about Bruce McKaig, check out www.brucemckaig.com.